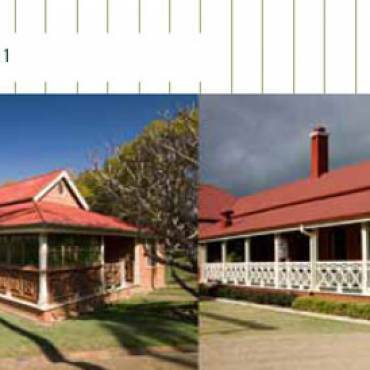 Further changes to the house were prompted by the Prince of Wales proposed visit to Nindooinbah in July 1920. Dods’ entry porch was replaced by a ‘tented ballroom’, usually referred to in subsequent decades as the morning room or the sunroom. A shorter pergola remained after the larger ‘ballroom’ was constructed. It is likely that the bathroom was added to the main bedroom for the Prince of Wales’ proposed visit. The programme for the Prince of Wales’ visit shows that he planned to arrive at Nindooinbah at 3.30 pm and to leave Beaudesert railway station at 10.30 pm. It is possible that the bathroom was constructed in case the notoriously bad roads forced the Prince to remain overnight. The bathroom, probably designed by Dods’ partner, Francis Hall, who designed the ballroom, is an important example of an early ensuite bathroom. Bathrooms in the later Edwardian period in America, when cleanliness to the point of sterility was highly valued, were created to mimic a hospital in the home with ‘hospital white’ Predominating and white tiles replacing the heavy dark cabinets hiding ugly pipes predominating in older bathrooms. Francis Hall also prepared plans in 1921 for a carriage porch at the end of the northern nursery wing, but this addition was never constructed. It is likely that the notion behind the carriage porch was to provide a covered point of entry in wet weather. The Collins family was often absent in the 1920s, either in Sydney where the children attended school, or overseas. The family travelled extensively and spent considerable time in England in the 1920s when John was studying at Oxford. A tennis court was constructed in the north-eastern garden during the 1920s, and frequently used for entertaining during the next few decades. A small round pavilion, with an internal fountain, was constructed in conjunction with the tennis court. During the 1930s, young people – the Persses at Wyambyn and Tabragalba and the Collins family – frequently walked or rode to each other’s houses and events such as the 1929 Nindooinbah-Tabragalba polo match were often held. Horses had continued to be a major interest at Nindooinbah. Photographs from the late 1920s show the unusual two storey stables, possibly built in the Ernest White era and no longer extant, in a line of buildings which give an impression of the ‘street of buildings’ found on complex pastoral stations, such as Mundoolun and Jondaryan. The Nindooinbah stables had a line of stable doors in its northern elevation, a large door on the upper level, through which hay was unloaded, and large double doors in the western wall. 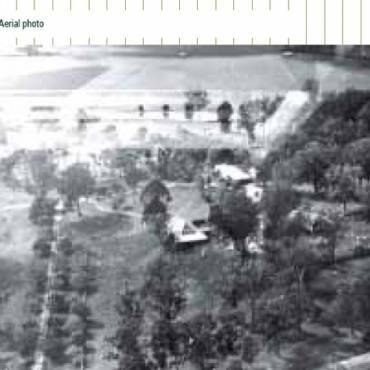 The stables are visible in a circa 1935 aerial photograph, although other outbuildings are obscured by trees. Mrs Collins’ youngest daughter, Janette, was frequently photographed on her horse, Spearfass, a grandson of Spearfelt which won the Melbourne Cup in 1926 and was himself a great-grandson of the great Carbine. Domestic animals, particularly Dalmatian dogs, were also important at Nindooinbah and are shown in a videotape dating from about 1930. John Collins, born in 1906, became the Nindooinbah property manager in about 1928, after completing his degree at Oxford. 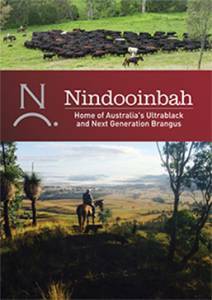 The creation of the five Nindooinbah dairy farms in 1931 was among John Collins’ developments. Two of the dairies, Cainbabel Creek and the Gorge, were owned by his sisters, Beryl and Janette. John Collins lived in a house located outside the main Nindooinbah gateway on its south-western side. The core of this house may well have been the kitchen wing from the 1858 house, dismantled and reconstructed to contain material from the original house. It was extended during Collins’ occupancy and its sunken bath became a talking point. John Collins married Margaret Hagon, daughter of a former Lord Mayor of Sydney in 1933 and it is likely that an extension to the house to create a ‘party room’, with a plastered ceiling and decorative cornice, was constructed at about this time. A built-in cupboard in the room housed Collins’ trophies; he was a successful horseman and one of Australia’s earliest amateur champion snow-skiers. John Collins had been the sole male Collins family heir since the death of R M Collins’ son, Christopher, in the 1919 influenza epidemic. John Collins became managing partner of Collins White in 1936, succeeding Douglas Fraser, who had married William Collins sister, Bertha. The Collins White Company was dissolved in 1941 following John Collins death. 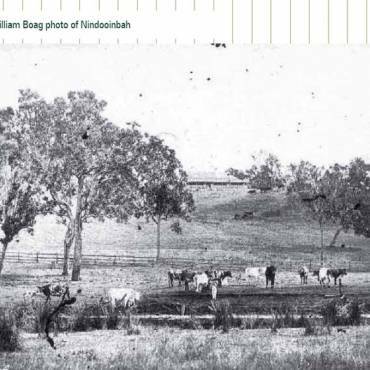 The Nindooinbah airfield on the broad flat alluvial fields between the lagoon and the Albert River appears to date from John Collins’ active years at Nindooinbah during the 1930s. Collins was a keen aviator who participated successfully in many competition events. He was killed in an accident at Archerfield airfield in May 1941. His mother and sisters donated a large stained glass window to St John’s Cathedral in Brisbane in his memory. The window, by the distinguished stained glass artist, William Bustard, was installed in the northern wall of the nave.